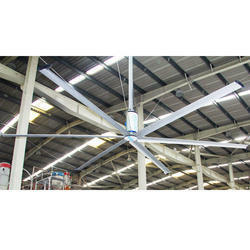 Prominent & Leading Manufacturer from Pune, we offer hvls electric fan, high volume low speed fan, industrial heavy duty hvls fan, helicopter fan, giant fan and bldc fan. Working Area 16900 Sq. 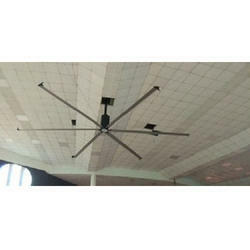 Ft.
HVLS fans can drive a large amount of air in very large space and circulate air across an area up to 20 meters from the fans center in all directions (over 1600 sq. meters for a 7.3-meter fan ). Air from above in pushed down to the floor below in a cone shape and then moves in a horizontal stream. The technology offered on our Industrial HVLS Fan is with the latest Aerofoil Blades, which ensure maximum airflow and minimum power consumption. Ecoair High Volume Low-Speed Fans & Exhaust Fans Systems. 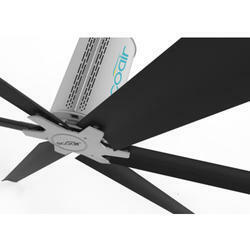 HVLS Fans are not just overgrown versions of your typical ceiling fan, it is designed and engineered to address the specific problem of ventilation needs in large space. Because of its unique design and large size, the slow revolving can create a massive but gentle current of air in all direction with 25 times the airflow of the traditional small ceiling fan. Companies such as Gree, Caterpillar, Mahindra, Bajaj Auto, and Honda are already using HVLS fan solutions in their facilities to gain cost reductions. Coverage Area 16900 Sq. 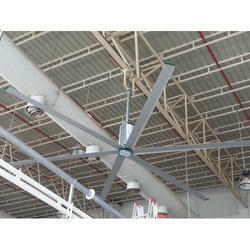 ft.
We are offering a Large Commercial Ceiling Fan to our client. We are offering Helicopter Fan to our client. 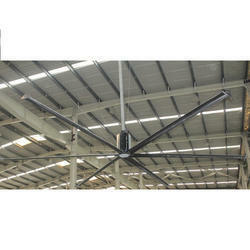 We are offering Giant Fan to our client. We are offering BLDC Fan to our client.